A personal water craft (PWC) is a type of recreational vehicle on which a rider sits or stands. Image credit: Holly Morin. 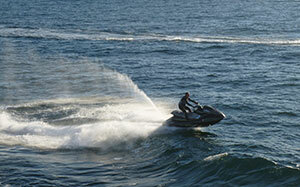 A personal water craft (PWC) is a type of recreational vehicle on which a rider sits or stands. They are typically less than 4 m (13 ft) in length, carry a driver and possibly one or two passengers, and can reach speeds up to 65 mph. A PWC is powered by a 2-stroke or 4-stroke inboard engine, which drives a jet water pump. Water is taken in through the bottom of the PWC, drawn through a rapidly spinning impeller (a rotor-like device located inside and to the rear of the PWC), and expelled at high-pressure as a stream of water that propels the PWC. Little is known about underwater sounds produced by PWCs and their potential impact on marine life. Underwater recordings of PWCs in Bramble Bay, Queensland, Australia, contained broadband energy between 100 Hz and 1kHz and tonal signals associated with impeller blade rotation. The broadband signals were associated with the vibrating bubble cloud that is generated by the high-power jet stream of the vehicle; the frequencies of the tonal signals varied depending on the speed of the PWC. Tonal energy persisted over longer ranges than the noise from the vibrating bubble cloud. In a study in Sarasota Bay, Florida, sounds of PWCs traveling at 25mph or 40mph were recorded and then played to Florida manatees for the purpose of studying their behavioral response. The four underwater PWC recordings were played back at 157-166 underwater dB at 10 m (peak sound level), which were similar to the recorded levels at the same distance. The study found that the frequency of animals directly moving to deeper waters increased during PWC approaches.